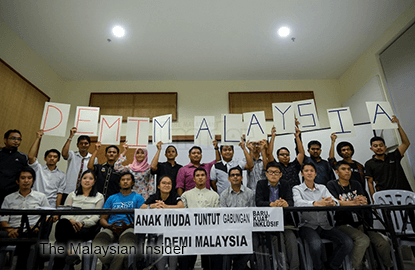 KUALA LUMPUR: Young activists from various civil society movements urged political parties to set up a new, stronger and more inclusive coalition for Malaysia. The group, calling themselves Anak Muda, also asked that a meeting be held among interested parties within 14 days to discuss the suggestion. Its spokesman Adam Adli said it is important for the parties to heed the group’s call for a new opposition coalition, as it represents the silent voices who want change. Adam added that Anak Muda would continue to push for dialogue between interested parties to be held within two weeks, to prove that the group is serious about change. Activist Syukri Razab of Suara Rakyat Malaysia (Suaram) said this would be an opportunity for opposition parties to show their determination to bring new politics to the country. “We have had enough of opposition parties like PKR, DAP and PAS who make their own decisions and focus on their own party’s agenda,” Syukri said. This article first appeared in The Edge Financial Daily, on July 3, 2015.